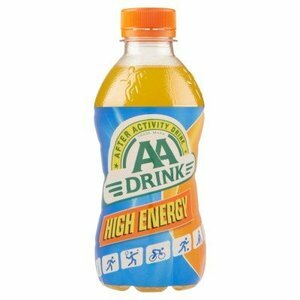 AA Drink High Energy is a hypertensive drink with a complex sugar composition. Such a composition is of great importance for building up the energy (glycogen) stocks in the muscles. Ingredients: Water, sucrose, dextrose (grape sugar), fructose, maltose, higher saccharides, maltodextrin, nutritional acid: citric acid, preservative: potassium sorbate, exotic fruit flavor, antioxidant: ascorbic acid, stabilizer: E445, dye: betacarotene, sodium chloride.